High strength solvent based, two component epoxy paint. It is highly durable and resistant to abrasion, chemicals and corrosive liquids. Extremely durable to mineral oils, both salt and chlorinated water, but also extreme weather conditions. Apply it on surfaces such as hospitals, wineries, dairy plants, garages, gas stations etc. Apply it also on permanently exposed (to moisture and the elements) surfaces, such as pools and fountains. Available in three basic colors: white, gray and light blue. Use the Measuring System for Shade Rendering DUROCOLOR of DUROSTICK (20ml syringe packaging) together with the white color to create 120 additional colors. Create anti skid surface by broadcasting QUARTZ SAND of DUROSTICK (with grain size from 0.01-0.5mm) on the fresh surface. 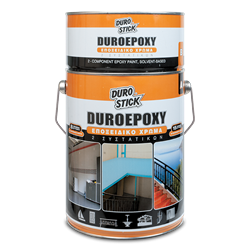 1kg/4-5m² per coat, on properly prepared surfaces.